Egypt so slender flowed endlessly. She flowed from the moment of Creation when god Ra’s seed alone had touched her. The first moment merged with the second like drops of water and became time. In time, Egypt drifted from Ra’s perfection. To right her course, Ra transformed himself into the sun so he might rebirth Egypt at every dawn. He also bequeathed to Egypt’s rulers the magic to raise the Inundation and rebirth the land of Egypt every year. At the dawn of every year, sun and river rose together. Man fears time, but time fears the pyramids. 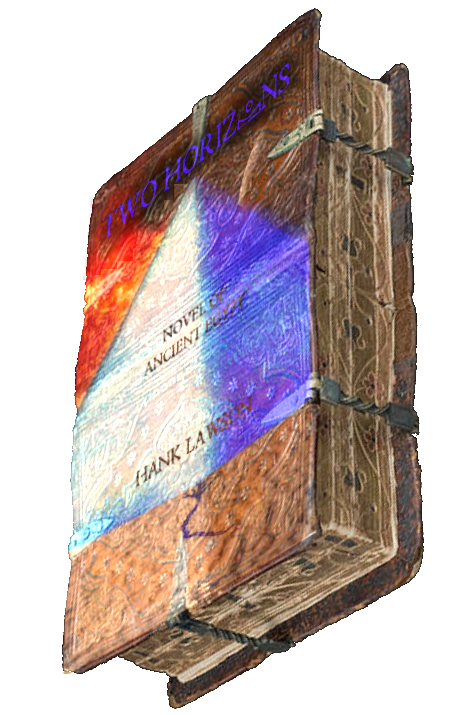 Set in ancient Egypt, Two Horizons tells a prince and pauper story. Mehi, an earnest 18-year-old-commoner, learns his father is a tomb-robber. His quest to rescue his family’s honor begins with volunteering to work on the dangerous Great Pyramid’s construction. Though his friend falls to his death from the pyramid, Mehi feels his love with An-khi, the governor’s daughter indicates the gods’ forgiveness for his family’s sins. Khufu’s own quest in perfecting his nation is similarly fraught with regicide attempts, murder of eldest son, a mad prince, and catastrophic drought. His love for a harem woman Theormi is scuttled when Khufu is forced to exile Theormi to protect her from the jealous queen. Mehi also loses his love. Ankhi’s father decides to marry her so he might hold onto his estate as is Egyptian custom. Then Mehi’s quest faces the ultimate test; his brother plans to steal Khufu’s mummy. 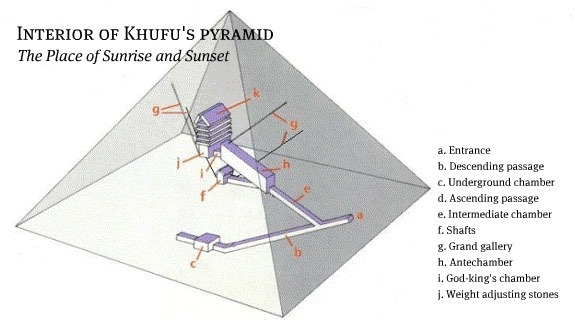 At the novel’s climax Mehi’s and Khufu’s quests intersect inside the Great Pyramid. Several legends about Ancient Egypt should be put to rest. Slaves did not build Egypt’s pyramids. Love built them. This same love of nation later created the Apollo moon mission at the behest of the American leader. Because Egyptians believed the God-king must live eternally to guarantee their existence, they entombed God-kings in stone. For a mere one hundred years, the tomb was a pyramid. Egypt’s leader who built the Great Pyramid was God-king Khufu, not Pharaoh Cheops. “Pharaoh” comes from the Ancient Egyptian “Per-O,” which means palace. A similar mistake bastardized Khufu’s name into Cheops. Egypt’s kings were believed to be imbued by the Creator gods with divine, if transitional, magic that raised the annual Nile flood that gave life to Egypt surrounded by desert. Herodotus relayed the lie that Khufu was a tyrant. Rather, Khufu fed his people when the Nile’s yearly Inundation flooded farms for four months of every year. Otherwise, they would have starved. Ancient Egypt clung to the Nile. Its flow of water divided horizons of sand. After thousands of years spewing across the land like a beheaded snake, the Nile settled into seasons of inundation, recession and drought. 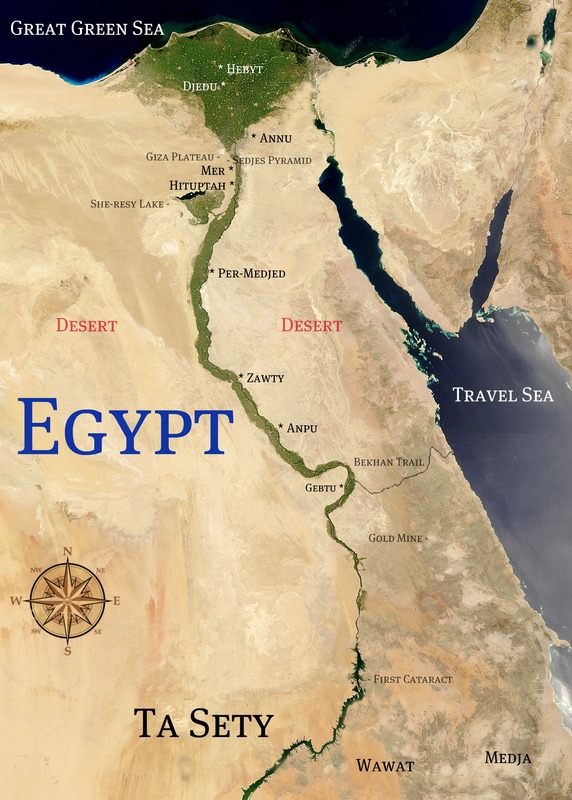 The black silt the Nile’s annual Inundation deposited on either bank when it receded caused the Egyptians to call their nation Kemet, the Black Land; it provided not only crops twice in a season, but also the habitable strip of land we call Egypt. Despite the impulse to maintain the perfection of its Creation, Ancient Egypt evolved over its 3,500 years. Most fiction about Ancient Egypt is of a time one to two thousand years later than in this story. For instance during this time, Egyptians built little with stone that wasn’t a pyramid. Stone was only beginning to replace mudbrick even in temple construction. Rather than being obsessed with death, Ancient Egyptians believed that a life so wonderful could not end. Because they wrote their story of the afterlife on stone that story survives. “Khufu on the Throne” by Hank Lawson. Click here to access the full album.